Powers/Abilities: Coachwhip is armed with sharp segmented metallic whips on both wrists. These can be (and usually are) strongly attached to her gauntlets so that they can not be quickly removed by foes. The whips can be electrified (presumably via the heavily insulated gauntlets) with variable charges sufficient to at least stun humans; Coachwhip has said that she can generate 20,000 volts. (Captain America I#341/2) - Others having already infiltrated the Society, Coachwhip invaded the Serpent Society's Citadel from outside. (Captain America I#342) - Fer-de-Lance and Coachwhip located Diamondback and Sidewinder in the Citadel's communications room, but Diamondback managed to knock Fer-de-Lance out. Rather than face Coachwhip, Diamondback activated Sidewinder's cloak and teleported herself and Sidewinder away. Viper set Puff Adder and Coachwhip to stand guard over the four Serpents who would not follow Viper, and succeeded in convincing Cottonmouth to join them. However, Diamondback and the Captain came to the rescue of the others, and Coachwhip was knocked out. (Uncanny X-Men Annual#13) - Cobra accepted a commission from Ghaur (Deviant leader) and Llyra (Atlantean) to retrieve items of arcane mystic power; he split the Society into squads. Anaconda, Black Mamba, Rock Python, and Coachwhip went to Lima, Ohio, where an American Indian totem was buried. 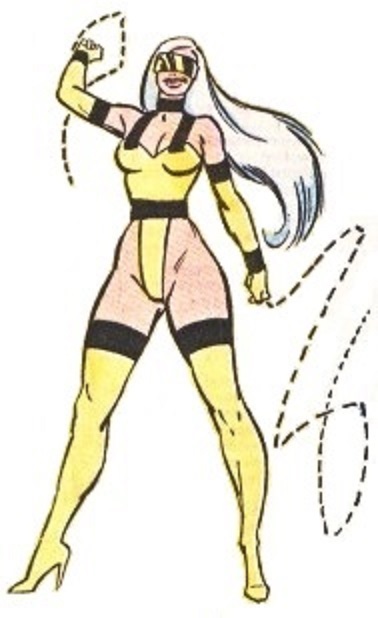 When members of the X-Men investigated the teams fought one-on-one; Rogue played crack-the-whip with Coachwhip. The X-Men retrieved the item and the serpents returned home. (Captain America I#355) - With Puff Adder and Rock Python, Coachwhip attempted to steal Sam Wilson's Falcon suit. Battlestar intervened, giving the Falcon time to don his costume, and he quickly knocked out Coachwhip. (Captain America I#365/2) - Coachwhip was present at a Serpent Society meeting when Cobra announced that a mystery man (Loki) had teleported into the Society's Bronx headquarters. Cobra asked the group to keep an ear out for information about the stranger. (Marc Spector: Moon Knight#10) - When various supervillains started a riot in New York, Coachwhip went looking for trouble and joined up with Killer Shrike and Ringer. The trio soon encountered Moon Knight. Ringer proved to be a detriment to the team, accidentally entangling Shrike, which allowed Moon Knight to force him to flee. Now facing her opponent solo, Coachwhip attempted to fry Moon Knight with her whips and was on the verge of succeeding when a bystander sprayed her with a garden hose, causing he gauntlets to short out; the charge from the short knocked Coachwhip out. (Captain America I#367/2) - Bushmaster told Cobra they'd had to spring Coachwhip after some difficulties. Coachwhip was present at a noon meeting of the Society the next day where Cobra announced that he felt that he'd been underperforming as their leader and now intended to correct that and lead them to new heights as King Cobra. (Captain America I#380 - BTS) - Coachwhip began a romantic relationship with King Cobra, referring to him as "love" or "cutey pie." (Captain America I#380) - When the captive Diamondback was tried by the Society for treason, Coachwhip acted as prosecutor and was part of the majority which voted for her death. Coachwhip was with King Cobra when Black Mamba and Asp barged in to object, and quietly left them to talk, musing that "they'll get theirs." (Captain America I#382 - BTS) - After Diamondback invaded the Serpent Society's headquarters, Black Racer, Rattler, and Coachwhip were recalled. (Captain America I#382) - King Cobra led Black Racer, Coachwhip, and Rattler against Captain America, Paladin, Asp, Diamondback, and Black Mamba in the Society's headquarters. Coachwhip went after Mamba and the semi-conscious Diamondback, and began frying both with her electrified whip. Diamondback threw an empty hypodermic needle at Coachwhip, hitting her in the forehead and putting her down. Captain America saw Coachwhip and much of the Society hauled away by Guardsmen. (Captain America I#434) - In a small town in Arizona, Fer-de-Lance and Rock Python were robbing a bank when they were stopped by Jack Flag. King Cobra interrupted, with Anaconda, Coachwhip, Cottonmouth, and Puff Adder. Flag announced he wanted to join the Society; Anaconda knocked him unconscious and they took his body along when they helicoptered back to their base. As an initiation test King Cobra sent Jack to steal something a painting for him, not telling Flag that he was stealing from Mr. Hyde. The next morning at the Sandhaven Community Center, Coachwhip was present when Jack Flag showed up, having successfully completed an initiation test which King Cobra had sent him on (expecting him never to return). (Captain America I#435) - King Cobra auditioned Jack as his eventual replacement as King Cobra, forcing him to run a gauntlet of the Society serpents, including Coachwhip. The fracas was ended when several people interrupted, including Free Spirit. Coachwhip, lacking her gauntlets, carried her whips loose in her hands to fight Free Spirit but lost, rendered unconscious via a choke hold. Spirit then used Coachwhip's costume and whips to infiltrate the Society. (Captain America I#436 - BTS) - Coachwhip slowly recovered. (Captain America I#437) - Coachwhip rejoined the Society and they had Jack Flag and Free Spirit cornered when Force Works (an Avengers' offshoot) came to the pair's aid; within four minutes the Serpent Society was defeated. They were taken into custody by the team. (Captain America IV#30) - Coachwhip was present in the Society's underground New York-area headquarters when Captain America and Diamondback (really an LMD) awoke chained to a pillar after having been captured by other members of the Serpent Society. (Captain America IV#31) - Coachwhip was there while King Cobra taunted Diamondback, promising to punish her for her betrayal. Sixteen hours later, Cap escaped; King Cobra summoned the rest of the Society and Coachwhip was one of many to respond; she was knocked out by the Captain. S.H.I.E.L.D. subsequently took Coachwhip and the rest of the Society into custody. (Amazing Spider-Man I#562) - With several of her fellow serpents (Puff Adder, Rattler, Rock Python) and in the company of other criminals, Coachwhip patronized a Bar With No Name in New York City, where she and the others watched the Basher challenge Spider-Man to a fight via YouTube. Bets were placed on prospective results of the fight, and that night, she returned to the Bar to watch the fight on TV (not only did one Spidey show but two did, leading to accusations that the bets were rigged). See was still at the Bar later when Spider-Man showed up there. (Amazing Spider-Man I#563) - Coachwhip and the other criminals in attendance battled Spider-Man, but stopped when the bartender reminded them that the Bar With No Name was a sanctuary for those being hunted by the law - which currently included Spider-Man. Spider-Man then pressed the bar's occupants for information on the Bookie; the bartender gave him a lead and he left. (Secret Avengers I#29) - Coachwhip hung out in an alley in Bagalia. (Secret Avengers I#30) - Coachwhip made out with Thunderball at the bar known as "The Hole". (Captain America: Sam Wilson#4) - Coachwhip was at a meeting of Serpent Solutions, the rebranded Serpent Society, in a conference room with Captain America (Sam Wilson) as captive. Captain America, who had temporarily been turned into a wolf/human hybrid, had just been captured by Serpent Solutions members Black Racer, Copperhead, Cottonmouth and Diamondback. (Captain America: Sam Wilson#5) - Coachwhip was present when Viper (Dixon) monologued to Captain America (Wilson) about how Wilson was destroying America and Serpent Solutions' businesses. Viper ended the monologue by shoving Cap, who had been paralyzed by Asp and was bound to a chair, out a window. He was saved from certain death by the new Falcon (Torres), who was then confronted by Serpent Solutions, including Coachwhip. (Captain America: Steve Rogers#13) - Baron Zemo met with Serpent Solutions to ask them to join his Army of Evil. Coachwhip was one of the members joining him. Coachwhip was given the name "Keener" in Official Handbook of the Marvel Universe: Teams (2005). This may have come from someone's attributing the name of a person answering the phone in the Stuyvesant Arms Serpent Citadel to Coachwhip (this was Captain America I#382); however, she was out of the building at the time at Sidewinder's apartment. Maybe a relative? In Captain America I#434, many of the Serpents are lying at the pool unmasked. This woman (left) was there - she appears to have Coachwhip's visor and general build, and in the following issue (#435) Free Spirit knocked out Coachwhip and disguised herself as her, complete with a long white wig. So... the original Serpent Society OHOTMU Update appearance lists her with white hair - maybe she dyed it red for a while and wore a wig when in costume? She received a first name in Jack Flag's entry in OHOTMU A-Z HC#5. Thanks to Ron Fredricks for the cleaned up images.